The Bottom Line: The brilliant first entry in a promising new YA adventure series. What do you get when you cross Star Wars with Top Gun and The Hunger Games? The answer is Skyward, a sci-fi military thriller that even Tom Clancy fans may love. 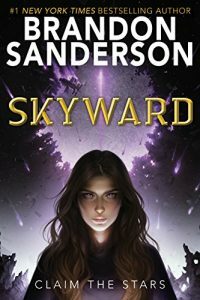 In the action-packed Skyward, a girl dreams of becoming a pilot in a dangerous world at war for humanity’s future. No one will let Spensa forget what her father did, yet fate works in mysterious ways. Flight school might be a long shot, but she is determined to fly. And an accidental discovery in a long-forgotten cavern might just provide her with a way to claim the stars. Readers will fall in love with the clever, scrappy pilot at the heart of this novel.